Susan W. Dunning was raised in Florida and attended college at University of Florida, New York University, Adelphi University, University of Southern Mississippi, and University of South Florida. After receiving a Master of Arts in art education with a ceramics major, Susan moved to Vermont, in 1972 where she set up a pottery studio. For 6 years she wholesaled her pottery, then opened a store in Ludlow, Vt. for 12 years. In 1990 she sold the store and continued to throw pots, but her main focus was farming organically with Peter Dunning. 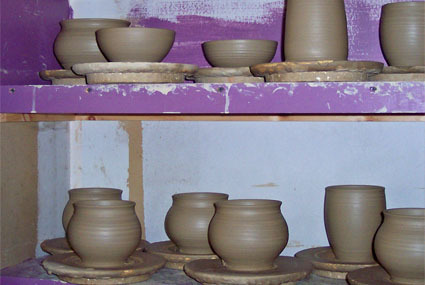 In recent years, the focus has shifted back to throwing pots as well as vegetable and flower gardening. In recent years she has increased her glazes to include a light blue, a cobalt blue, a green (used often in combination with the cobalt glaze), a turquoise brown, a blue and black combination, and recently a black and hazel combination called Black Iris. Her pottery has always had an emphasis on providing a functional piece of stoneware pottery at an affordable price. The pottery made by Susan W. Dunning is made from Georgia red clay and a fireclay. It is fired to cone 9/10 or about 2300 degrees Fahrenheit. There is no lead in any of the glazes. It is dishwasher safe, microwave safe, and can be put in an oven if not shocked by going from cold to hot. It is best to put it in a cold oven which is then turned on. Never put plates in the oven. If you are not satisfied with your order, please notify me within 10 days. You may return it for a refund or exchange except for "SKY" pieces and special orders. All "SKY" pieces are made to order and are not returnable. Shipping costs are not reimbursed. I do not pay for the second shipping charge on exchanges unless the return is due to my mistake. The buyer is responsible for packing the item so that it arrives intact. Insurance is suggested. If the buyer supplies an incorrect address, buyer will pay any additional shipping costs. Not every piece of this hand thrown pottery is in stock; therefore, all customers will be notified within 12 hours as to availability of this hand thrown stoneware pottery. If the particular piece of pottery is not in stock, you will be informed of approximate delivery date.